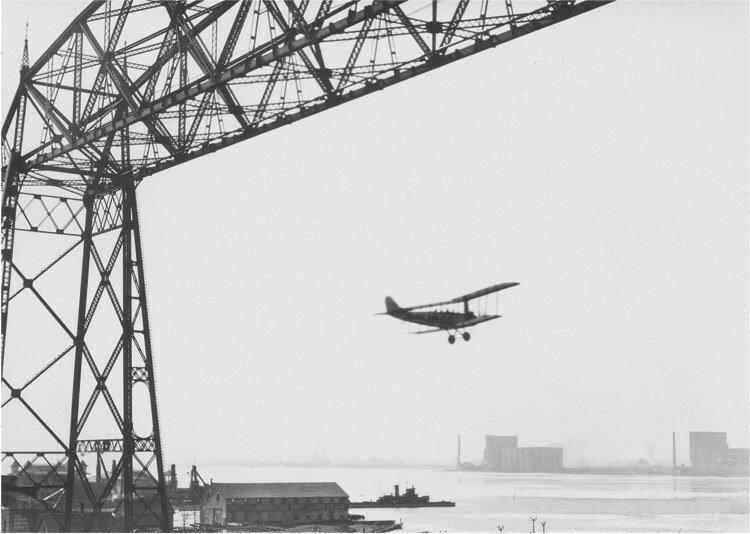 Five years later, on March 18, 1918, pilot Wilber Larrabee became the next person to pilot an airplane beneath the aerial bridge. Larrabee, of Minneapolis, was in town to perform a “revue” of acrobat flying, with the dive beneath the bridge his headline maneuver. Unfortunately, a follow-up article on Larrabee did not provide any details of the stunt and only reported that it had been accomplished. Others would follow Larrabee, but few would leave a record of the event—and that has caused legends to brew. William Magie did it in 1924, at least that’s what his wife Lucille told a reporter in 2005. Magie was a mail pilot who flew a WACO biplane. When he landed after threading the bridge, police were waiting for him—but they didn’t arrest him. It was all just a prank, he explained. His story could well have been a prank: he told it to his future wife a year after it supposedly happened. He may have wanted to impress the future Mrs. Magie. Local historian Glen Maxham does have proof of someone flying through the transfer bridge: film footage given him by David Hartley. Shot from the plane’s cockpit, the film shows the bridge coming closer and closer until the plane passes through and flies beyond. Hartley’s father knew a character named “Dusty Rhodes,” a sometimes-bootlegger “notorious for doing things like that.” Rhodes was likely the film’s pilot—if that was his real name. If the pilot of the next recorded barnstorming incident was trying to impress anyone, he forgot to leave a calling card. That flight occurred on October 19, 1929—the very day workers freed the bridge’s truss and raised it forty-two feet for its conversion. Newspapers reported that a seaplane, entertaining the crowd watching the slow work, began “circling and dipping close to the top of the bridge, and even flying under it while the span was slowly moving upward.” But no one took a picture, and no one took credit. A helicopter passed through once, as shown in the above photo from the Lake Superior Maritime Collection. Unfortunately, the photo includes no notation, so the date and pilot are lost to history. The helicopter appears to be a Sikorsky H-5, first made in 1945, so the flythrough would have to have occurred after that date. Many people think World War II Ace and local hero Richard A. Bong barnstormed the bridge. Bong, a native of Poplar, Wisconsin, shot down forty Japanese planes while flying his beloved P-38, nicknamed “Marge” for his wife. In 2006, John Hoff told a reporter he witnessed Bong take his P-38 through the bridge in 1944. Hoff was eleven years old at the time, visiting his father’s office in the Alworth Building. 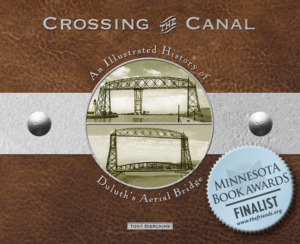 He swears he saw a P-38 fly in low from the east between the canal’s piers and emerge west of the bridge. Unfortunately, no one else saw it. Roy Mahlberg of Duluth told the newspaper he remembers the Duluth News-Tribune’s headlines the next day and a photo of Bong’s P-38 flying under the bridge. But no newspaper account of Bong flying his plane through the bridge exists nor any photos. Bong certainly was capable: he once flew a loop-the-loop under and over the Golden Gate Bridge. Maybe Hoff did see a P-38 pass under the bridge, but Bong likely wasn’t at the stick. It may have been Jack Daniel Brown, a Duluthian and Army Air Corps pilot. Brown’s descendants recalled that in either 1943 or 1944 (which would fit Hoff’s story), he and another pilot were ordered to transport two P-38s from Texas to Novia Scotia. Along the way, Brown decided to say hello to some relatives in an unconventional manner. First, he buzzed the Park Point home of his brother, lift bridge operator Bob Brown, close enough so his family could see his face; then he and the other pilot approached the bridge from the bay side, barnstormed beneath it, and headed to the east coast of Canada. Of course, no one took a picture….